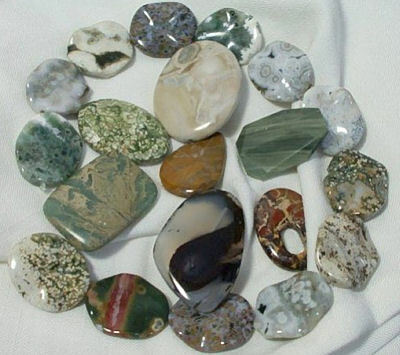 Jasper is an opaque form of silica of many colors and variations such as bands, speckles, and circles. A form of opaque chalcedony, jasper often forms in massive formations. Jasper frequently has a descriptive name from the location where it was found, for example ocean jasper, rainforest jasper, or mountain jasper. Otherwise, it is named for its color or appearance. The most common jaspers are red, yellow and brown, however you will find green, grey, white and many other wonderful natural colors. Jasper helps to re-align all chakras, and integrate those energies for our greatest good. Jasper is considered a Power Stone and a medicine stone that accepts intense responsibility as a protection Stone. Jasper gives one the courage to speak out and have personal independence. Its a stone of the earth, and therefore a very “grounding” stone. All Jaspers have excellent protective energies. It stabilizes the aura, and provides cleaning of dysfunctional energies. Think of the term “Solid as a Rock” and Jasper comes to mind. It is a stone that works slowly, providing constant, slow, deliberate energy, especially good in time of needed change without the chaos a total upheaval would cause. Excellent for those in hospitals and recuperating from surgery. Jasper is a stone that reminds us we are not here only for ourselves, but to bring joy and guidance to others, helping them to reach a higher plain. Its a nurturing stone, a good stone for the healers to use on the behalf of others. Both Kings and Priests used Jasper for spiritual and protective qualities. It is said to be one of the stones used in the breastplate of the High Priest. A good stone for working with shy or timid people who need change. Protection: From other people, forces, and from yourself! It can keep you from getting carried away, or being lead astray, and being diverted from your goals. Loyalty: Jasper was once considered a Warriors Stone, so it knows of loyalty, inner strength, injustice, and standing up for what you believe in. Justice: A power stone for those who stand for justice and fair play, especially useful for those whose job it is rectify unjust situations, such as lawyers, advocates, judges, attorneys, para-Legal, sheriff, policemen, defenders, and soldiers. Courage: Helps to give you courage in preparation for conflict, either physical or emotional. Mental Healing: A good stone for people in counseling or therapy, who want to overcome addictions or compulsive behavior, and gather up their strength for the emotional battles ahead. Jasper is a powerful stone for those seeking sobriety. Red Jasper is particularly used for help in preventing “set backs” or or “slips” in disorders. Physical Healing: Restorative influence on kidneys, spleen, liver, bladder & stomach. It can help restore a lost sense of smell.